Shambhu Patro is belongs to Patro indigenous community living in a remote village of Sylhet sadar upozela under Sylhet district. Now he is reading in class four at Kushal government primary school near his village. Patro is one of the most marginalized indigenous community in Bangladesh. 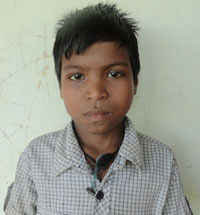 Shambhu’s father Jatindra Patro died when he was only four. They have no any source of income. Now his widow mother Kulshi Patro is maintaining her family of five members by engaging herself as a day labor. In this situation Tulshi Patro cannot afford necessary expenses of education for her son Shambhu Patro. Now she is seeking for financial support from any organization or from individuals. So, on behalf of Shambhu Patro ECDO is requesting for providing necessary support for continuing education of Shambhu Patro.